The Hobby Blog Page of Pete James: Scaramanders...? 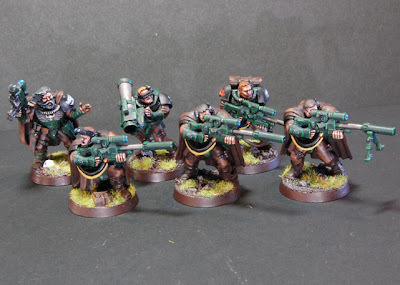 OK Bond fans, so these guys don't carry golden guns for a million a shot... they're essentially White Scars in Salamanders armour, but they're a bit different from the normal armies you see on the tabletop and here's the story. 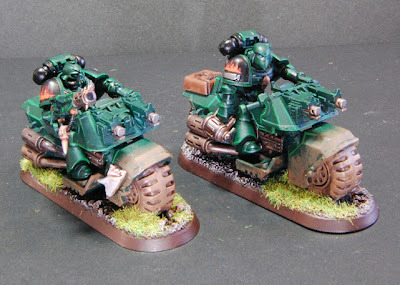 The whole thing started after a colleague at work bought me a space marine bike from the local store for the office Secret Santa one Christmas. As it was a one-off I raided the bits box and converted him up a bit, with a powerfist, head from the old Space Wolves upgrade frame and a couple of other bits and pieces. 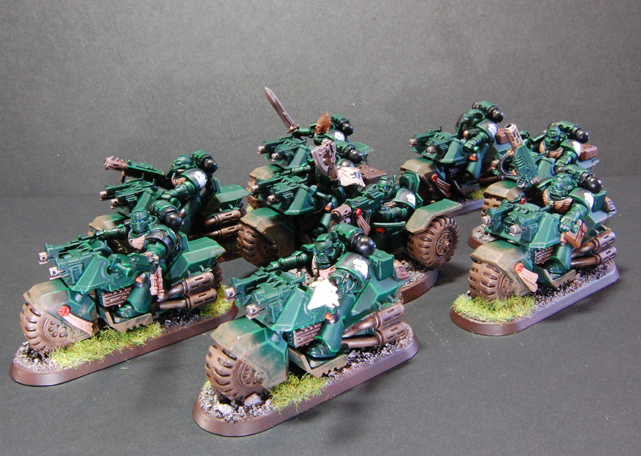 He turned out pretty cool and after re-reading the Space Marines codex, I decided it would be fun to have a bike based force. The original guy became the Captain (front centre). The cool thing is, if you equip your Space Marine Captain with a bike, you can take bike squads as Troops choices instead of fast attack, which is a great thing. Hanging back in cover and making a last-stitch swoop on an objective could be a game-winner. Whenever I set about a new army, I tend to build it around several units that are a little quirky that would be fun to play and/or interesting to model and try to balance the list with complimentary units. It doesn't always make for the most competitive list, but I've never been a maths-hammer-style player and would rather spend the game talking about the cool figures rather than how many D6s you can roll. The bike-mounted command squad is quite a points-sink, but it's the only one I've seen played at the club. 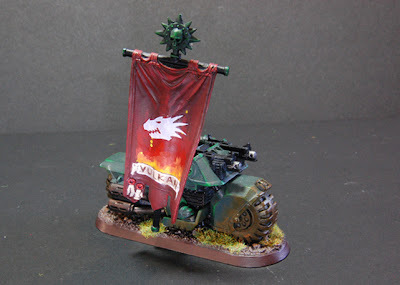 The banner gives the edge in close-run assaults and the Apothecary grants the squad 'feel no pain', also pretty useful when the fighting hots up. Add to that two meltaguns and a flamer, and they can bring the fight to virtually anything in the game. 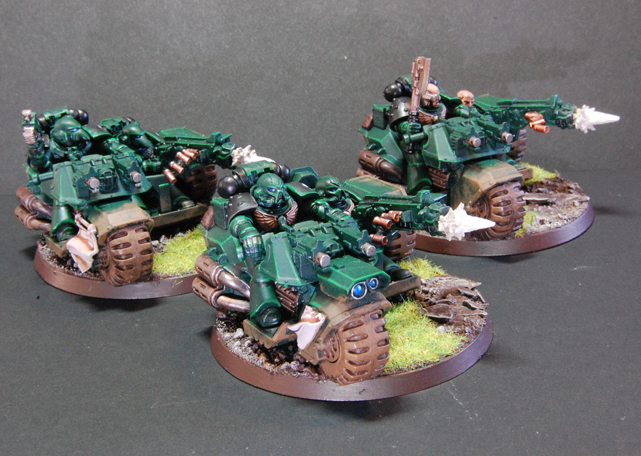 The stand-out moment for this squad was a drive-by powerfist to a Chaos Dreadnought, which was pretty funny! To bring some heavy firepower to the mix, there are two three-model squads of attack bikes with heavy bolters. There's been some talk about taking multimeltas instead, but I wanted to be able to dish out volume of fire from the mid-range while still having the greater flexibility of movement afforded by the bikes. Remember, bikers are relentless, so can move at full speed (not turbo though!) and fire their weapons at max. Bolstering the number of Troops choices available are two Scout squads. 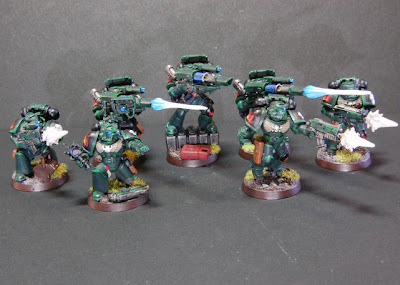 One is kitted out with sniper rifles and a rocket launcher, with a Salamanders version of special character Telion (far left); the other with bolt pistols and combat blades. Their Sergeant packs a rare punch in Scout squads with a powerfist (looted from the Cadian kit). The sniper squad is normally deployed on the 'home' objective, preferably in decent cover with a good view! The other can outflank and surprise the opposition, causing them to re-think their strategy. Out of the whole army, it's the close combat scout unit that has achieved the most notable success. 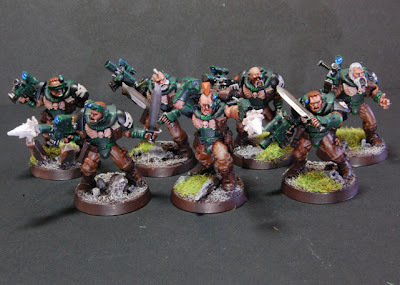 In a really enjoyable game against a 'Guard army, these guys tore through two 'Guard squads, disabled a chimera with the powerfist and were setting about dismantling the command section when the game ended. Rounding out the list is a Devastator squad, with three lascannons, three boltguns and a kitted out Sergeant that can defer a shooting benefit to one member of the squad if they themselves don't fire that round. 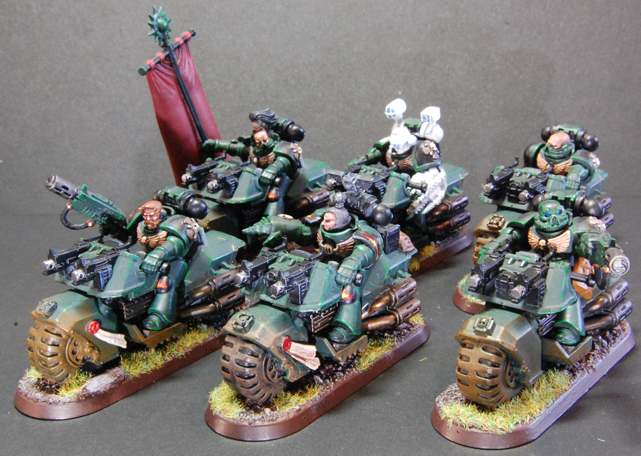 The paint scheme was relatively straight-forward, thanks to the Army Painter's Angel Green, and the whole force was base-coated in around 20 minutes. 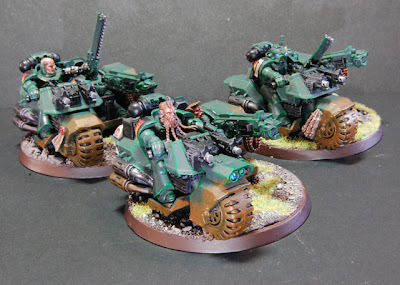 The armour highlighting was Snot Green; eagles are Dhened Stone, washed with Ogryn Flesh; shoulder pads Chaos Black with Mechrite Red/Blood Red/Macharius Solar Orange flame icons; mud and weathering is drybrushed Calthan Brown; lenses/scopes are Hawk Turquiose/Ice Blue/Skull White highlights; metallic areas are Tin Bitz, washed with Ogryn Flesh and highlighted with Boltgun Metal; bases are Scorched Brown/Dheneb Stone Drybrush with Citadel static grass detailing. The muzzle flashes and discharged shell casings were purchased from Armorcast based in Ohio in the States. I've had mixed success with this army; there've been some great wins and some total slaughters (vs mechanised Orks *cough*), but it's always been fun to play.